Georator manufacturers and supplies belt-coupled motor generator sets (rotary frequency converters) to all industries requiring the test or operation of electrical equipment using power characteristics (AC frequency) that are not available on the local power grid. Belt coupling is the simplest and least expensive method of coupling the drive motor to the generator, using drive belts and pulleys. This method not only transfers the energy from motor to generator, but also is used to change the frequency by pulley ratios. 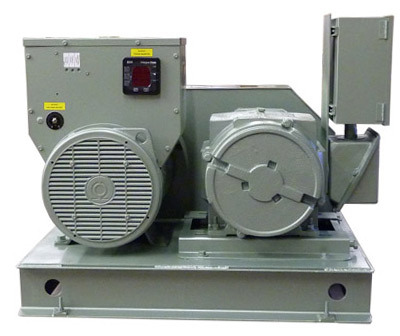 The motor generator set converts frequencies of 50Hz, 60Hz, and 400Hz with a 500KVA power capacity. Phase and/or voltage conversion are inherently available in this process. Complete electrical isolation from harmonics, spikes. Georator manufactures belt-coupled MG sets or rotary frequency converters to industries both within the USA and internationally. If you are a contractor or buyer interested in purchasing our belt coupled MG sets, our sales representatives can provide a quick quote for your project. Georator can custom design power equipment to meet your specifications. Not sure what you need? Georator's expert engineers are here to guide you through the specifying process. For all your frequency conversion needs, contact us online by completing the form here or give us a call at 800-523-9938 (+1 703-368-2101).